On my recent quest to stock up on my favorite drink, Oregon Chai, I was in a brief panic when I didn’t immediately see it. Only a few local stores carry it and often the shelves are empty, so when I do find it, I buy in bulk. I’ve never liked coffee, but I need my daily chai! I then realized the package had been redesigned. Initially, I was irritated. Did they change the packaging and the product? After ensuring the product had indeed stayed the same, and it was only a package redesign, I warmed up to the new look. Although being a designer myself, I wondered why the package was updated. That led me to their website. As a package designer and loyal follower of Oregon Chai for years, I am ashamed to admit I never read the back of the box, which has the story of how the company started (also on the website). I’m not even sure how I first found the product but I do know the reason I kept drinking it – it tasted as good as the Starbucks Chai Latte that I first became addicted to (thanks to an old friend who introduced it to me). I still love Starbucks chai, but this one is now my daily favorite. After reading the story and learning more about the product, the redesign makes sense. The overall design is lighter and better captures the story behind the product. The mountain graphic represents the inspiration of the founders’ trip to the Himalayas where she first encountered chai. The gold pattern along the side is also reminiscent of Nepal. The original purple and gold colors are retained and the logo has not changed, so I was able to see that it was the same product. The redesign also does a better job of highlighting the flavor call out, which is helpful to me, as I prefer The Original to the Vanilla, and I have occasionally bought the wrong one by accident. Additionally, I feel better drinking it knowing the product uses natural ingredients. The new package highlights this fact using a “Made With Natural Ingredients” seal on the front of the box– a great new selling point as it did not appear on the old package. Most of the concentrate products are also organic and non-GMO verified and according to their blog, the powdered products are in the process of being verified. The lighter look along with the new photo showing some of the ingredients, I assume, was done to call attention to being “natural”. The actual ingredient list was missing from the old package (probably another reason for the redesign), but the main ingredients are now listed right on the primary display panel. I was also inspired to try some of their recipes shown on the website using their product; what goes better with a chai, then chocolate cake! In addition, I was able to print a $1 coupon for my next purchase, an added bonus! 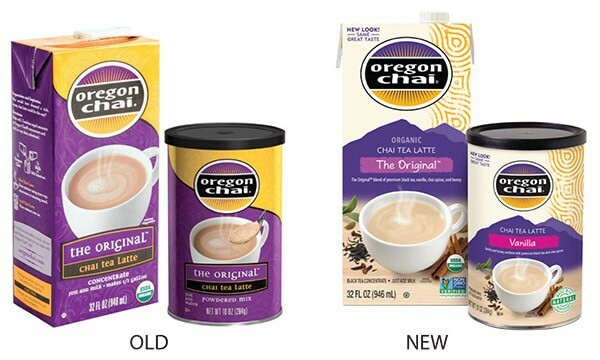 All in all, Oregon Chai’s package redesign does a great job of more effectively communicating their story, and letting health-conscious consumers know that they care about what’s in their products.